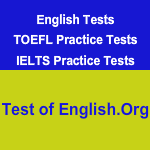 The TOEFL iBT has four sections – reading, listening, speaking and writing. Each of these four sections is scored on a scale of 0 to 30. The scores in the four sections are then added together. Your final score is on a scale of 0 to 120. Note that your section scores are as important as your final score. Besides your numeric scores you will also receive score descriptors as part of your result. These are explanations of what the numeric scores in each section mean. Most questions in the reading and listening sections are of the multiple-choice type. You will be given four answer choices from which you have to choose the most appropriate one. Questions of this kind usually carry one point. Some multiple-choice questions are worth more than one point. In that case, it will be clearly indicated so you will have no difficulty understanding the value of each question. The Drag-n-Drop Table Completion and Summary tasks in the reading section involve partial scoring. That means if some of your answers are correct, you will get a portion of their total point value. In the Drag-n-Drop Summary you will receive 2 points for 3 correct answers. If you got only two answers correct, you can still get 1 point. If only one of the three answers is correct, you won’t receive any point. In the Drag-n-Drop Table completion tasks, you will receive 3 points for 5 correct answers and 2 points for 4 correct answers. You will receive no points if you get 3 or fewer number of answers correct. Another variation of this task has 7 questions. If you get all of them correct, you will receive 4 points. You will get 3 points for 6 correct answers and 2 points for 5 correct answers. You will receive no points if you get fewer than 5 answers correct. The total number of questions you answer correctly in these two sections are then converted into scaled scores of 0 to 30. Your speaking and writing samples are rated by human raters. Each of your speaking samples is given a score between 0 and 4 and each of your writing samples is given a score between 0 and 5. These scores, too, are then converted into scaled scores of 0 to 30. As you have probably already assumed, the highest score you can receive is 120. The lowest score is 0. Well, it depends upon the university. Prestigious universities will only admit students who have high TOEFL scores. To know the exact TOEFL requirements of each university, you have to contact them.